I have looked through my records and, if I have my information complete, I have made seven Christmas Tree Lots. The first one was made in November of 2016. It found a home in Baltimore, MD. 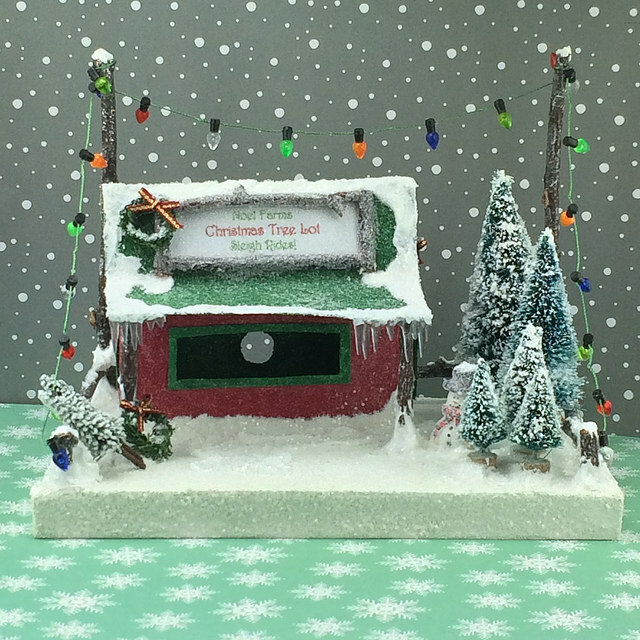 Noel Tree Farms was purchased by a local friend as a Christmas gift for a family member. I love the paper in the background. 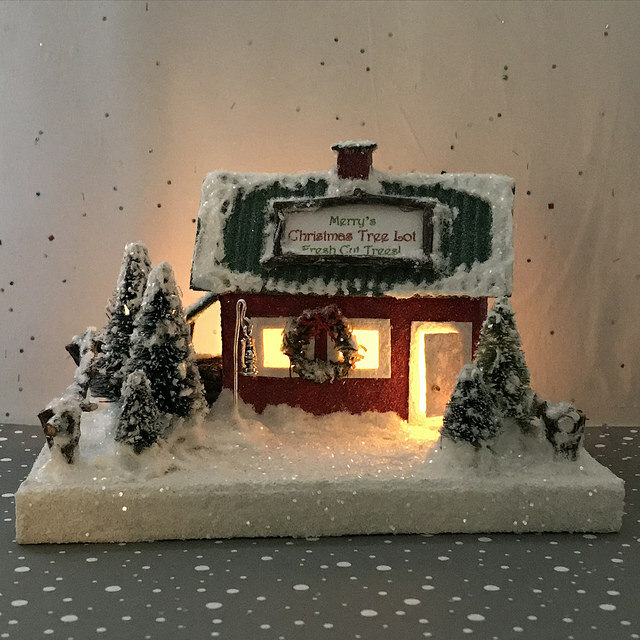 Perfect “snow.” I made this one in December of 2016. I posted it to Facebook in the evening and the next morning it was sold. 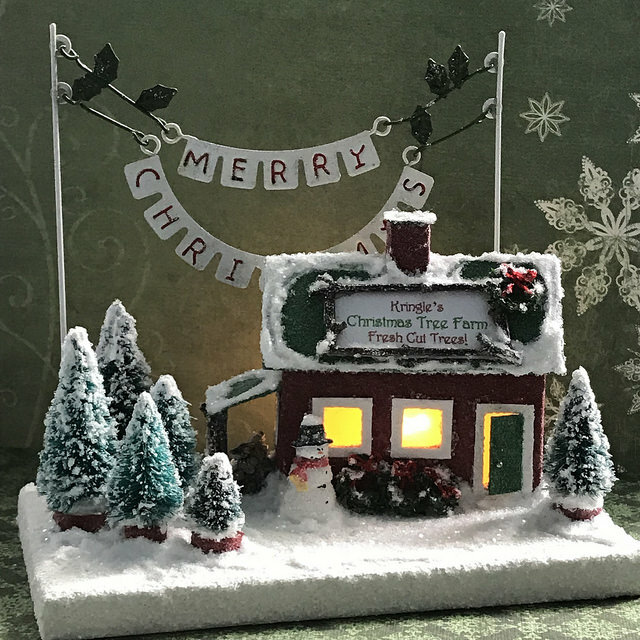 Santa’s Christmas Tree Farm went to Tennessee, where it joined a few other Putz houses I had made. This one was also made in December of 2016. 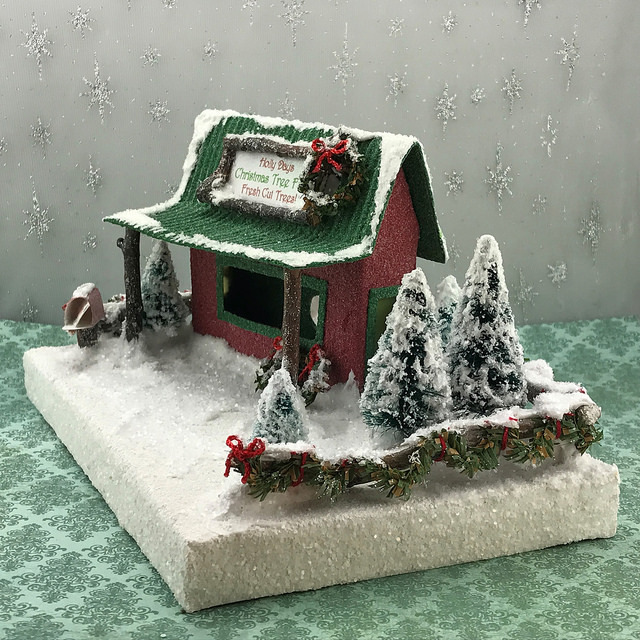 The North Woods Tree Farm is currently listed in my Etsy shop. It was made in March of 2018, but somehow missed being listed at that time. I just found it in my inventory storage, so have now listed it. 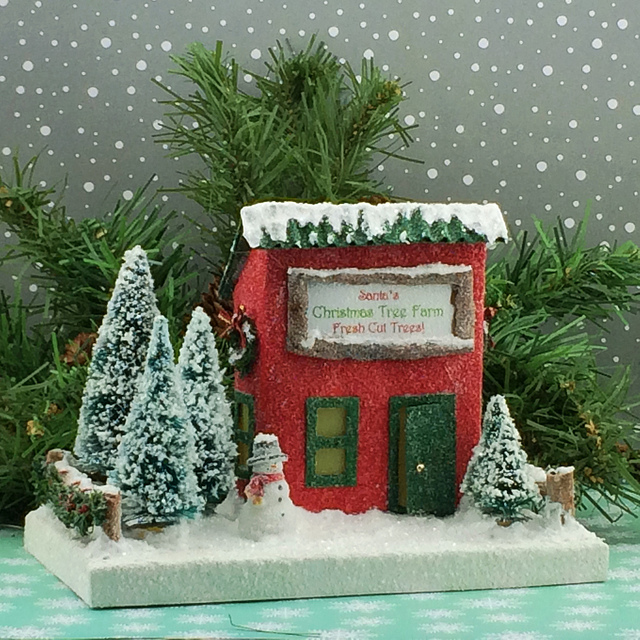 This Holly Days Tree Farm is the same pattern used for North Woods pictured above. I like the corrugated roof on this one. 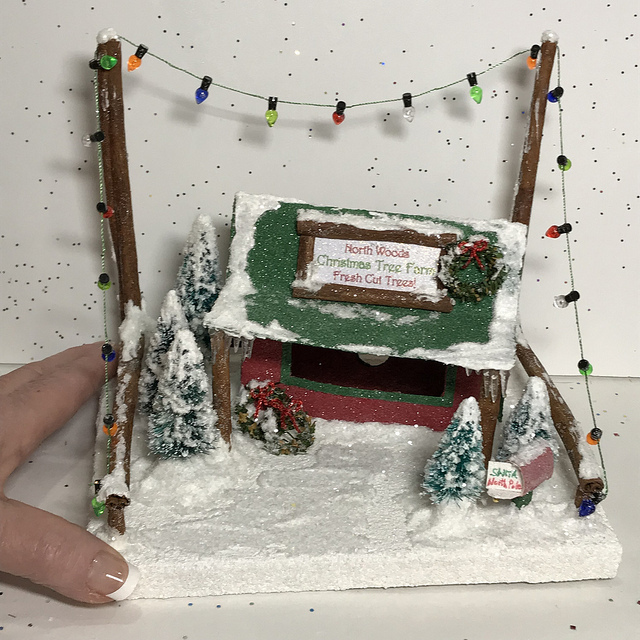 Holly Days was made in March of 2018. I believe Merry’s Christmas Tree Lot sold, but I can’t remember where it went. But how cute is that?? I may have to make a similar one for my own collection. Made in July, 2018. 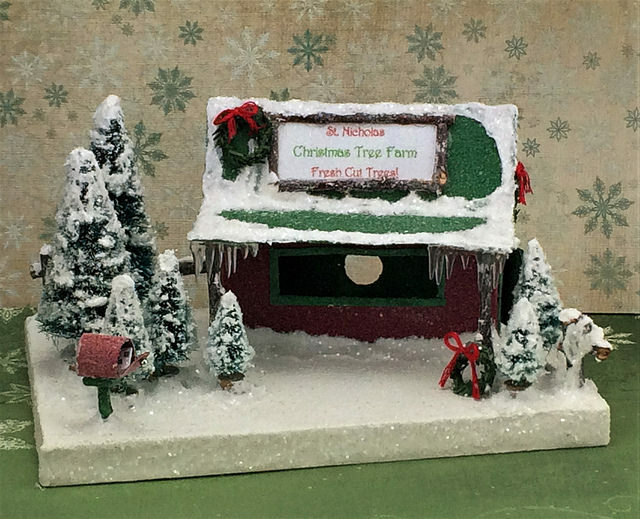 This is Kringle’s Christmas Tree Farm. I love the metal banner. I have two more of those and will use them on tree lots, when I get around to making more. I haven’t made one since this one in August of 2018. I think it’s about time to make a new one! This entry was written by ~~Rhonda, posted on March 26, 2019 at 6:25 pm, filed under Uncategorized. Bookmark the permalink. Follow any comments here with the RSS feed for this post. Post a comment or leave a trackback: Trackback URL.